Jordi Miralbell and Mariona Raventós are a couple of craftsmen of design that have little by little come to build a variety of pieces of domestic lighting and furniture, pure and poetic. 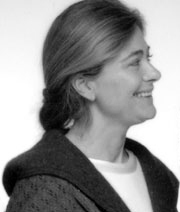 Mariona Raventós, born in 1955, studied with Jordi Miralbell at Barcelona's Elisava school of design between 1974 and 1977. Two years after, they set up their own interior and graphic design studio, m&j, in Barcelona. They soon expanded their professional career to special designs for movies and photography, publicity and stage design, and space lighting projects. In1986, they also started designing pieces of furniture, lighting and complements through their new production company, Neo-Series, that continued with their craftwork style. One of their first lamps, the Arco, included a parchment shade that Mariona would hand paint. Among their first works, we may find a series of fashion dummies, or a furniture and lighting collection called Atmósfera that was composed of the Arco lamps, the Sud and Vertical lamps, and the Oceanía, Bere-B and Asia pieces of furniture. Their conception of design led them in 1989 to become a part of Santa & Cole, for which they had already designed some pieces of furniture, and they ended up becoming, two years later, partners of the company. Miralbell and Raventós were responsible afterwards for the art direction of the firm, and as a part of the editorial committee they selected the products that the firm would edit. Many pieces of furniture and lighting elements edited by Santa & Cole at that time wore their signatures: the Dórica lamp; the Pie de Garza lamp(1997), awarded with the VII Premio de Diseño Nuevo Estilo in 1994; the lamps Turca and Suma (1999), Gala, Nova (1996),Disco (1995), Vertical, Tosca y Comodín (1994), and Boa and Sólida (1993); the Sistema Matricial, an interchangeable system of shades that allows to offer customized lamps; the Nif Naf Nuf, a set of three stools; and the Oslo armchair, young and cosy. As a team, Mariona expresses herself better with materials, textures and color, she represents the sensual part of the project, whereas Jordi contributes with volume, proportion, structure and supervising that the whole object will work. Their projects are simple and warm, they live together peacefully with all kinds of furniture. Their lighting elements offer different ways to give light thanks to parchment, wood, raffia or cotton and their poetic forms, thus reflecting the team's conception on life: design is the art of turning what is practical into a desired thing, into human warmness, into something that men have created.